Whenever I have people over, I always go to Latin Chic written by my friend Isabel González-Whitaker and co-author Carolina Buia. Living in the neutral territory of New York City where everyone is from somewhere else, it’s full of simple but great ideas to add a cultural twist that’s honest to entertaining in Latin American style. Looking for a dessert to bring to a dinner party, I made their version of Bien Me Sabe or “It Tastes Good to Me”. This one in particular comes from Carolina’s great-aunt Mercedes Camps. The legend goes that she made it for Venezuela’s future president Rómulo Betancourt when he was hiding from political adversaries in her home. It’s impossible not to admire a woman who not only offers refuge to those in need but then throws in dessert. After three weeks, she smuggled out the father of Venezuelan democracy disguised in one of her dresses. Barely adapted with permission from Latin Chic: Entertaining with Style and Sass by Carolina Buia and Isabel Gonzalez-Whitaker. This recipe also works well with light coconut milk, taking only a few additional minutes to thicken. I’ve also made it with only rum. People made pretty wild guesses as to what additional flavors I’d used, but I think it was just really good rum. Dissolve the cornstarch in 5 tablespoons of cold water. In a large mixing bowl, combine the egg yolks, dissolved cornstarch, and salt. Whisk until combined, and then set aside. In a medium saucepan, add the coconut milk, and condensed milk. Bring to a low simmer over medium-low heat, stirring constantly. The mixture should not come to a boil. Remove about 1/4 cup of the warm coconut mixture and stir into the egg yolks to temper them. Then pour the entire egg mixture in the saucepan, raise the heat to medium-low heat, and whisk constantly until the mixture begins to thicken. The second the mixture thickens, remove it from the heat and stir in the vanilla. This is very important: it will take only a minute or so to thicken. If it is left on the stovetop, the coconut cream will curdle and turn lumpy. In a deep 8×8-inch baking dish, arrange a layer of ladyfingers ( some will need to be broken in half so that they fit). 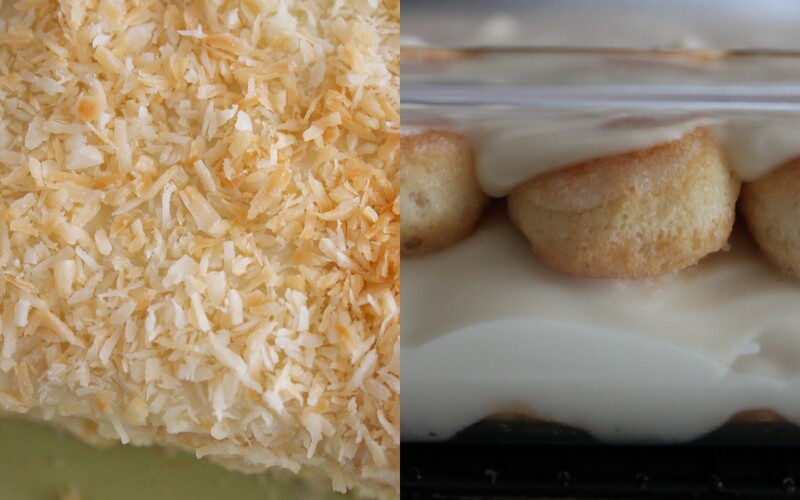 Top with up to a 1-inch layer of the coconut cream. 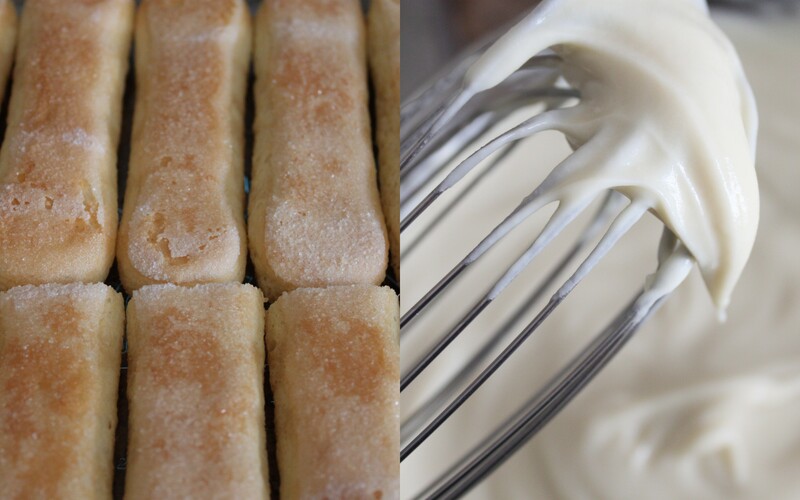 Add another layer of ladyfingers and the remaining cream. Smooth the top of the cake with a spatula. Chill overnight or for a couple of days. 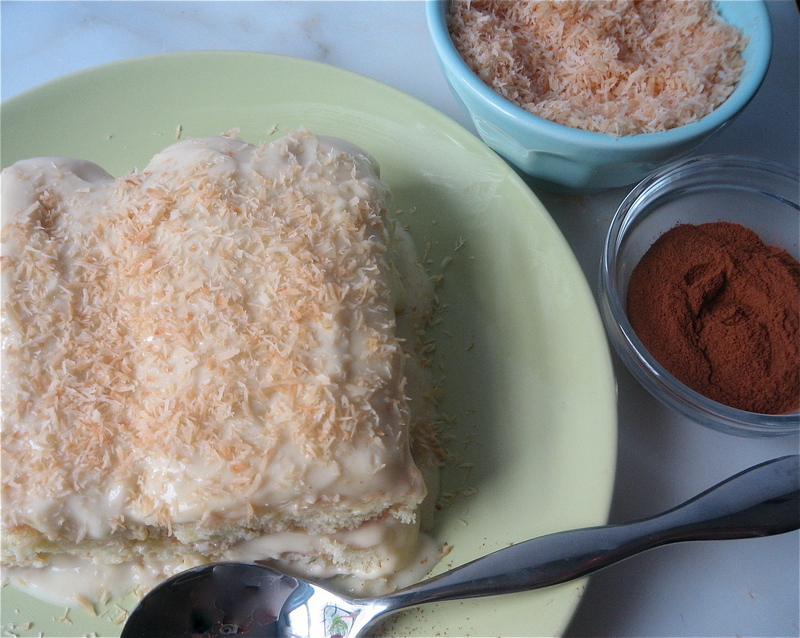 When ready to serve, use a sifter to delicately dust the top of the cake with the cinnamon or toasted coconut. This sounds delicioso. I will definitely be featuring this on A Chica Bakes muy pronto. This recipe is amazing! any ideas as to any specific occasions when this is typically served? quincenera? There are several versions of this dessert in Latin American but I don’t think it’s traditional for any one holiday or occasion. It’s origin is most likely Arabic and the original Spanish version uses almonds and cinnamon pastry cream which I cannot wait to try!